Day 2 of quitting smoking! And Myasthenia Gravis! I had lost total control over my hands and fingers. Couldn’t hold a fork. I couldn’t walk very far without stumbling forward as if I was drunk but not. My right eye was malfunctioning called ptosis where I could not control opening and closing my eye especially in the sun. Couldn’t brush my teeth or hair, or take care of my grandma and mom and my two boys as I have been doing. I couldn’t turn the keys to turn the car on, I couldn’t swallow food well or chew it, my kids said I always looked mad but I wasn’t feeling that way it was my facial muscles going nuts. The scariest part, other than useless hands and fingers was the scary breathing problem. My throat would close up and I could barely get air. It happened during extreme physical movement and terribly high anxiety times. All of a sudden the caregiver needed her own caregiver! Felt drained, similar to low iron feeling but deeper. Went to neurologist and got a blood test done, came back positive for Myasthenia Gravis. They prescribed me Mestinon (generic, under $2 for a month’s supply), 1/2 a tab (30 mg) every six hours. With the help of this tiny chalky pill, I’m nearly normal looking now. 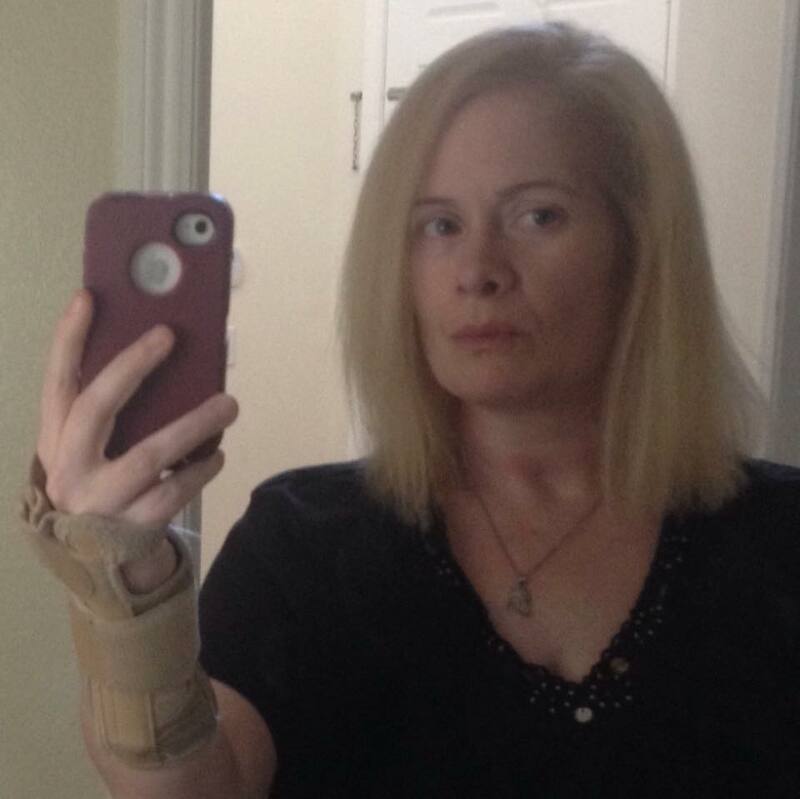 I no longer wear my wrist braces, I can walk without feeling exhausted after ten steps, I can do everything now, my eye works normal, I just get tired and sometimes, overheated. At those times, I lay down in bed with my fan and freeze myself, sleep a bit and get up after an hour or so feeling nearly normal again. Thank goodness this medication does not interfere with my depression, anxiety and ADD meds. But I found that if I smoked a cigarette (Marlboro Special Blend), it made me dizzy and sick. I was smoking up to 6 cigarettes a day. I quit cold turkey yesterday and found I only missed the actions of going outside and looking at the roses, listening to the birds, feeling the sun or wind, etc. I did not miss the taste of the cigarettes. I did not miss inhaling the smoke that would make my eyes water. So Day 2 is here and I have no interest in going outside and having a cigarette, there is a slight pull to follow my old routine of smoking but I stomp on it.. No one is telling me I have to stop smoking but myself. I do not want to feel sick AND it is a good example for my two boys. Am I eating more? Not really. I can type again now and I have had troubles with my cell phone carrier so they turned my service off so now my phone is a glorified ipod. I play spider solitaire, read via kindle app and other games that grab my attention. I’m not biting my nails and I can’t crunch on ice as it breaks my already fragile teeth. But I’m surviving. Having my hands back, my eye back in my control, my body back in my control is amazing! I am waiting for a scheduled MRI of my brain and a CAT scan with and without contrast for my chest. It seems we have this thing inside of us located at the top of our lungs, connected between them and we use it during childhood and by puberty, it begins to atrophy. But it plays an important role in Myasthenia Gravis. Sometimes there is a tumor on the thymus gland and much like Alien(s)chestbuster, they cut ya open and remove the thing. How do we go through our lives, I am 41, and never know about this thing inside? I can’t call it an organ. It’s so weird. So yay for a diagnosis, yay for a medication that is affordable and WORKS! and yay for day 2 of no more smoking! Sometimes there are days where I am very tired, and it is a disease that cannot be seen. Like MS too. People don’t understand that I had to use the handicap parking (only when there were more than 15 spots like at Target) when I couldn’t walk anymore. So even if you can’t see something, it surely doesn’t mean that something is not there! Pay attention to your body, research using the internet (but don’t go all hypochondriac!) before seeing a doctor. I told my neurologist what I thought I had and he told me I was absolutely right! How many times do you hear a doctor say that? Me but now without the braces!